"Hello, is Fr. Pepper there?" "Sr. Mary from the State Correctional Institute at Dallas. I was just hoping we are so in need of priests to come say Mass and hear confessions for the inmates on Saturday mornings. Is there any chance you would be able to help us out?" And just like that, out of the blue, I found myself involved in the prison ministry of the Diocese of Scranton. Prison ministry was never anything to which I had been exposed during the seminary, although there was the option for it as part of Notre Dame's Master of Divinity program. 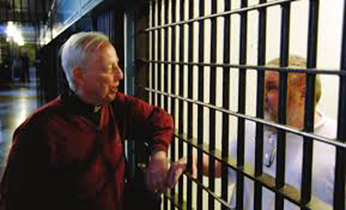 I knew of Holy Cross priests who had made prison ministry the hallmark of their priesthoods. I also knew that prison ministry ran in my family; my grandmother spent decades of her life bringing communion into the prisons of Tucson. Still, it wasn't something that I saw myself doing, nor would I have considered myself particularly equipped for the jobuntil that random phone call came through from Sr. Mary in the middle of July. I have been to the prison three times so far, and I love it. Each visit has its stories. The first time, I was vested and ready to go for Mass when the prison went on lockdown on account of a fight in the yard. All the men had to return to their cells, and I had to leave the prison altogether. There was no Mass that day. The second time, I go up to the security entrance (I'm in my blacks, mind you), ring the bell, and hear from inside, "Who does this **** think he is?!" I learned a lot more that day about the sorts of power differentials that exist between the inmates, the staff chaplains, and the guards. Last time, the man who leads the choir asked if I wanted to sing the Our Father. I said, "Sure, do you mean the regular chant version?" He said, "No, do you know the Mass for Our Lady?" I had to laugh. The Mass being sung in the Basilica of the Sacred Heart is the same Mass being sung in the State Correctional Institute at Dallas. Jesus is as fully present in one place as he is in the other. I also love going to the prison because it aligns with what I understand the charism of Holy Cross to be all about. Our Constitutions say, "Christ was anointed to bring good news to the poor, release for prisonersOur efforts, which are His, reach out to the afflicted and in a preferential way to the poor and the oppressed" (13). We are a community of men who live, work, pray at the intersections of the mysteries of suffering and hope in peoples' lives. The Catholic chaplain at Dallas, Sr. Mary, repeatedly tells me that her ministry is about helping people find and hold onto hope in the midst of life situations that seem all but hopeless. Talking to someone who is serving a life sentence for a crime committed when he was barely twenty, bringing communion to someone who has been in solitary confinement for a month, safeguarding a person's dignity when they feel like they are being taunted by the system it adds a whole new dimension to what we mean when we say, "Hail the Cross, our only hope!" Visiting the prison is also helping me to become a better preacher. 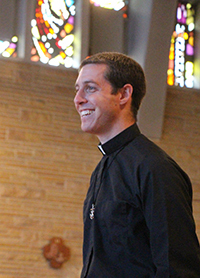 Recently, for example, I was looking for a homily that would work equally well for the inmates on Saturday morning (they celebrate their Sunday Mass on Saturday morning because that's when they can get priests to come) as with a local Maronite parish Saturday afternoon, a King's College Residence Life retreat on Saturday night, and an athletes' Mass on Sunday morning. It wasn't easy! It did challenge me, however, to listen to the Word of God with greater attentiveness for those who experience themselves on the margins of life. If preaching can be heard as good news in a prison, it can be heard as good news just about anywhere. A wise deacon once told me, "We are blessed when we are chosen to live with those among whom Jesus chooses to be found." Jesus chooses to be found among the poor, the suffering, the conflicted, the imprisoned. Finding Jesus there helps me see him all the more in my students at King's College.